Alton Augustus Adams, Sr., was a musician, writer, hotelier, and the first black bandmaster of the United States Navy. Born in the Virgin Islands in 1889, Adams joined the U.S. military in 1917. Although naval policy at the time restricted blacks to menial jobs, Adams and his all-black ensemble provided a bridge between the local population and their all-white naval administrators. 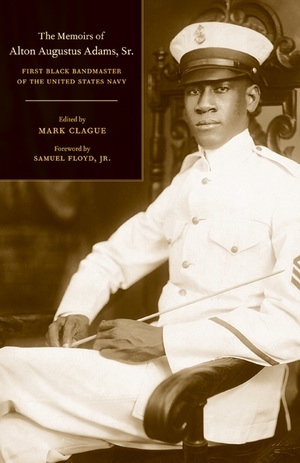 His memoirs, edited by Mark Clague, with a foreword by Samuel Floyd, Jr., reveal an inspired activist who believed music could change the world, mitigate racism, and bring prosperity to his island home. Alton Augustus Adams Sr. was a bandmaster and civic leader in the Virgin Islands in the first half of the twentieth century. Mark Clague is Assistant Professor of Musicology, American Culture, and African American Studies at the University of Michigan. Samuel Floyd Jr. is Director Emeritus of the Center for Black Music Research and series editor for Music of the African Diaspora, UC Press. Foreword by Samuel A. Floyd, Jr.